Apples were among some of the first crops grown in colonial America. Potted seedlings and bags of apple seeds were brought over on the Mayflower. The Bible-thumping Puritans were not teetotalers. Apple orchards in colonial America usually meant one thing: hard cider. Apples flourished in the fertile soil and friendly climate, and soon apples were a key part of most colonial farms and menus. The popularity of cider in America grew as the nation’s territory expanded. Then, the Temperance movement and popularity of German lager squashed the hard apple cider movement … until 2013. Zealous connoisseurs grow dissatisfied with the mass-produced apple cider sold by far-away, massive corporations. In response, they retreat to their basements and garages and start playing with recipes, learning about fermentation and putting their own spin on the old tried-and-true. Eventually, some hit on flavors in their homemade libation that are so tasty and unique, it seems a shame to hoard it all for themselves. They start putting some in bottles and growlers to share with like-minded friends and family. People flip out. Professional cideries began to pop up. It’s an explosion of craft cideries, and a return to the drinking habits of Colonial America. 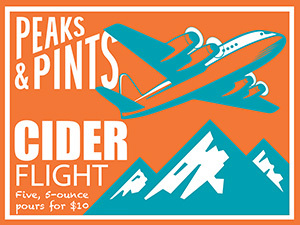 On this cold, snowy winter day, we offer the Peaks and Pints Monday Cider Flight 2.11.19: Cold Apple. In late 2010, Corvallis homebrewers Aaron Sarnoff-Wood and Lee Larsen filled a gap in the college town’s drinking scene — cider. The duo opened 2 Towns Ciderhouse crafting unique ciders brewed with the traditional English and French-style’s tannic apples, Oregon grown, of course. Discovered on Long Island in 1759, the Pippin Newtown is one of the oldest original US varieties of apples. Thomas Jefferson grew it and Benjamin Franklin took samples to the English royal court, causing it to become one of the first US apple exports to the UK. 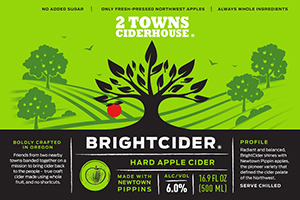 2 Towns Ciderhouse takes advantage of the apple’s sweet, rich flavor in its BrightCider, which shines a spotlight on Newtown Pippin with a little help from other Northwest Varieties. The BrightCider is fermented cold to slow the fermentation process, retaining the aromatics of this heirloom fruit. The result is balanced flavor — partly sweet and partly dry. A select blend of Certified Organic Washington apples from the Yakima Valley is fermented in stainless steel tanks at low temperatures to capture the full ester profile of the apples. Once fermentation is complete, this cider is then aged for 12 to 16 weeks in rye whiskey barrels from High West Distillery in Park City, Utah. The 2017 Good Food Awards winning Finnriver Oak & Apple has bright citrus with a smooth whiskey depth and spicy rye spirit. Woody astringency balances the acidity, and then finishes with lovely toasted oak and vanilla notes. Made primarily from culinary/table apples modern ciders are generally lower in tannin and higher in acidity. Seattle Cider Company, the city’s first post-Prohibition cider producer, delivers delicious modern ciders. With zero percent residual sugar, its Dry is a very dry cider in a classical style. The dryness doesn’t equate to a lack of flavor, however, as it still has a refined apple nature underlined by notes of stone fruits and a light tickle of lilac on the nose. It’s a cider that can stand alongside one of our roast beef sandwiches without losing the flavor battle. Port Townsend’s Alpenfire Cider created this a single varietal rosé cider with Hidden Rose apples, a rare, dessert apple variety. The aroma is composed primarily of a really luscious, ripe apple character. Amazing! On the palate expect a robustly built cider, sporting rich tannin, notes of caramel and a rich weightiness that is tamed by the sparkle. Not atypical cider by any means.